FEATURING: Slipknot, Judas Priest, Korn, Bring Me The Horizon, Mastodon, Clutch, Corrosion of Conformity, Trivium, Ghostface Killah, Mobb Deep, and many more! KNOTFEST IS… a camping and heavy music festival event with an entire weekend of chaos taking over San Bernardino, Ca Oct 23rd, 24th & 25th. Due to the graphic nature of the festival as well as the long, hot festival hours, children under 10 years old are not allow entry. 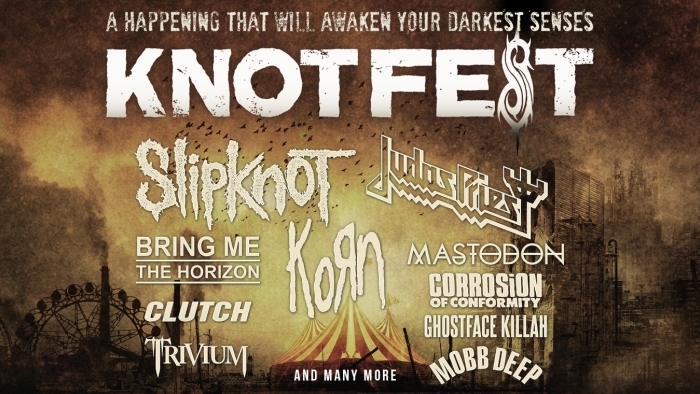 To quote the Clown, “Slipknot is no longer a band, they are a culture.” Birthed from that culture is the experience known as KNOTFEST.